Words by Kevin Doocey on December 24, 2010 . 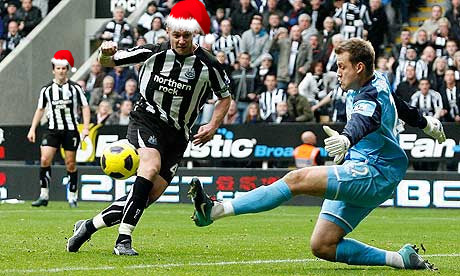 NUFC - Has been a hectic year for Newcastle United as club but enjoy Xmas! It really has been a frantic year as a Newcastle United supporter. From January till May, we were crowned Coca Cola Championship champions with a record number of points, and back in the Premier League after a little while away. We had made great improvements since the bad years upon Tyneside, with stability under Chris Hughton, and a great team spirit amongst the lads in the dressing -room. The Premier League campaign has so far been very pleasing for Newcastle United fans. Although Mike Ashley took the shocking decision in sacking Chris Hughton after all his wonderful work, Alan Pardew is now manager and we must get behind him and the lads in order to keep NUFC in the Premier League. We have had some brilliant results this season; including a demolition of rivals Sunderland, historic win away at Arsenal, Chelsea and indeed a pleasant win over Liverpool a few weeks ago. There are a lot of memories for Newcastle United fans to cherish in 2010, and we shall cover those in a special article in the New Year, with a compilation Wallpaper for anyone interested in downloading it. Being a Newcastle United fan is a testing ‘religion’ but year after year the fans continue to support the team through thick and thin, hail, rain and snow. We just hope come 10pm St.Stephen’s Day, we can report to you that Newcastle United have beaten Manchester City at St.James’ Park. Thanks to all, and a happy Christmas!